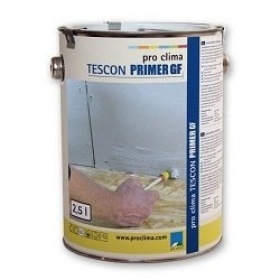 Adhesive primer for gypsum fiberplates to prepare the surface for the connecting bonding with the pro clima adhesive strips TESCON No.1, TESCON VANA, TESCON PROFIL, BUDAX TOP and the connection adhesive strips ORCON F and ECO COLL. Before using, shake the can or stir. With 1 liter Primer you can treat 10 m² surface. The duration of drying can become longer with a higher relative humidity. TESCON PRIMER GF contains 50% solvent (ethanol). There has to be sufficient ventilation while handling because natural alcohol vapours can be explosive. Keep distant from ignition sources, do not smoke. Please log in to download the technical data sheets.